"He's 18. He doesn't have a tooth in his head." The brave chihuahua named Paco grew up with a pit bull, so was used to having brawn behind him. 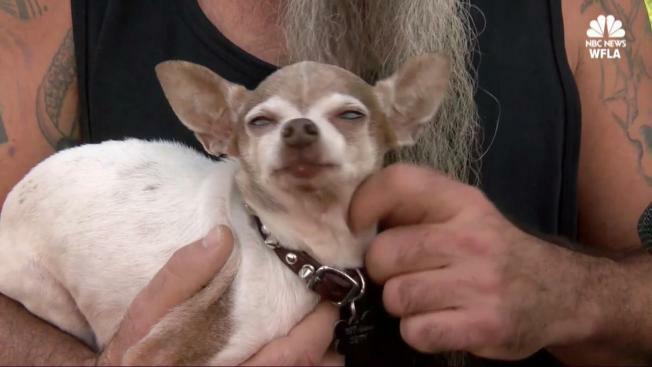 A toothless Chihuahua named Paco took on a potentially deadly carnivore Thursday, after a coyote wandered into the backyard of his Florida home. Paco's owner, T.J. Jones, caught it all on a video security system. "He was face to face that coyote. [It was] five times his size. [He] stood his ground, hid under the shed until I came out," said Jones. An abandoned railroad line with plenty of brush is behind Jones' house, making it a perfect place for a coyote to hide. It's likely the wild animal stopped by for dinner or dessert. "He's 18. He doesn't have a tooth in his head," Jones said of Paco. "He's a little sweetheart. He was my Dad's dog. I'd lose it if I lost him." Jones says Paco learned his bravery from a pit bull he used to live with. "He's always had the big mouth and had the brawn behind him." "They're out there and people have a lot of small dogs. He got lucky," Jones added. "I don't want to see something bad happen to someone else's dog."